In the top sketch we see the most common cross-section for the forward part of a ballista’s stock. The dovetailed slot is where a separate slider would track going in and out of the stock. The bottom sketch shows the cross section of a stock that utilizes a non-moving rail system for the catch assembly to ride on. The grooves at points 1 and 2 form the underside of the rails. This is a system that has worked extremely well on Firefly. It is many times superior to the old, full length slider system that I had on my Gallwey. I daresay, rail type systems are many times the functional superior of conventional, long, wooden sliders. I’ve tried ’em both extensively, and speak about this with over 1000 rounds of ballista fire under my belt. Urp! So, what to make of the famous original carving, seen below? Photo supplied, and the carpentry elegantly photoshopped, by Mr. Randi Richert. The simplest and most literal interpretation of the incised line (see red arrow) seen in the fore-end of this ancient depiction of a ballista, is that it most nearly resembles the two grooves seen in the rail type design mentioned above, (i.e. bottom sketch). 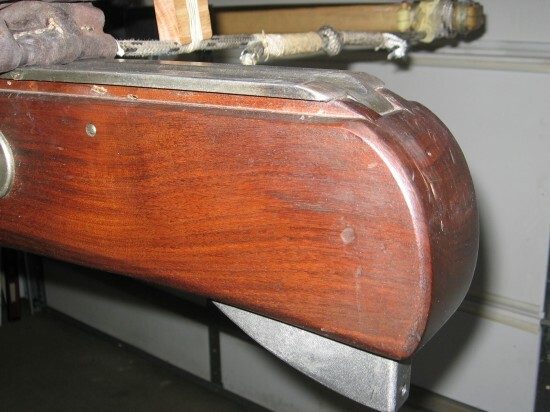 The long wooden slider style (top sketch) shows only clean, ungrooved surfaces on the side of the stock. Also, if you magnify the forward part of the stock in the above photo, it is clear that the incised line and the rail that it represents, goes all the way to the end. This is important because that would allow a moving catch assembly to slip on and off for maintenace purposes. Occam’s razor suggests the simplest explanation to match all the facts, ……..etc, etc. Maybe the pesky old Roman that carved the INCISED LINE, was going for a racing stripe look or something….. Not much Occam in that line of thinking, though. Therefore, the simplest interpretation is that the incised line on the carving represents one of two grooves for a rail system that utilizes a moving catch assembly to hold the bowstring. 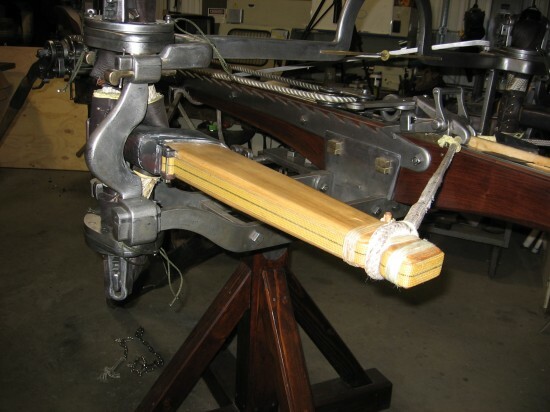 Not encumbered by a long length of wooden slider, it can run up and down the rails while the bolt groove remains static. In short, just like Firefly. Nestled into his time machine, Teddy waves goodbye for now. In a few moments the Temporal Streams start to merge and the dematerialization process will begin. The little fella’s got more guts than I do, climbing into that thing. The dials have been set for June 27, 363 AD, latitude 44.7250664 N, longitude 22.3954239 E.
When he returns, his friends here in the Okanogan anticipate some lively tales around the campfire. Here’s hoping the air stagnation advisory is lifted by then. First off, let me apologize for the yuk factor in this posting. I wouldn’t include all the graphic detail if it weren’t necessary to flesh out the argument ……. so to speak. To start off, here again is the Maiden Castle skull from 43 BC. We are attempting to see if the square hole in the artifact could have been caused by one of Vespasian’s ballistas. I finally got around to measuring the velocity of the shot that produced a square hole in the frontal bone of our pig’s head. The 6500 grain bolt was only traveling at 105 fps, a fairly remarkable speed given the short 13″ draw length that was used. The bone that it penetrated was almost 7/8″ thick, with a honeycombed appearance on the inner side, and unlike the dried out sheep skulls used by Mr. Wilkins in a similar experiment, ours were still nice and juicy. 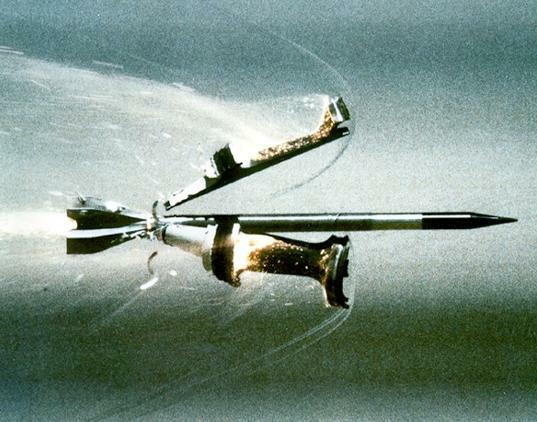 Here is that photo of the wound created by a ballista bolt going a very slow 105 feet per second. 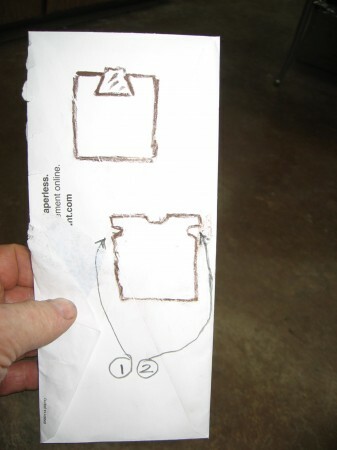 And so, to restate: Our tests indicate that any over-penetration beyond the square, quadrobate section of the head simply smahes out any clean cut square hole, turning it into a more jagged shape that can accommodate the larger diameter round section. A pretty obvious state of affairs that backs up Mr. Wilkins conclusions on the matter. Given that the temporal bone on the Human artifact is probably only 3/16″ or so thick compared to the 7/8″ thick frontal bone of our test subject, the velocity of any bolt would need to be many times slower than the 105 fps used in our tests if it were going to make a clean square sided hole in a relatively frail human skull. In fact, shots taken into the thinner, 5/16″ temporal bones of our pig’s head proved difficult to control down to a level that only the quadrobate section of the tip made entry. When a pilum was used to pierce the pig’s skull, instances of over-penetration only resulted in a nice clean cut square hole. Again, a very obvious outcome given that with the shank of a pilum, the largest cross section that moves through the bone is never any greater than the square sided tip. The size difference between our test subject and a plastic model of a human skull, can be seen below. In conclusion, while it is possible for a ballista bolt to make a square shaped hole in a skull, it is highly unlikely. 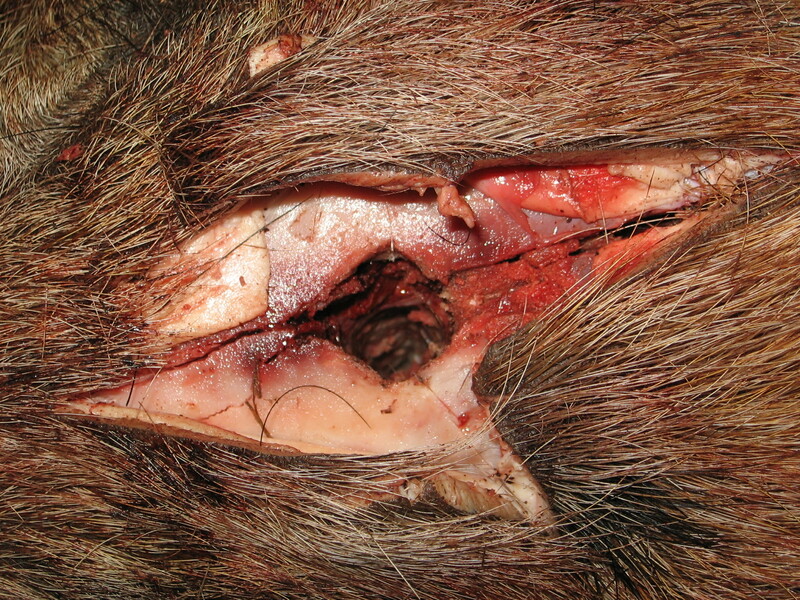 On the other hand, just as the Wilkins team discovered, a typical pilum will nearly always leave a square sided wound when thrust into cranial bone. Denouement: The Rebecca has a comment on all this Maiden Castle, bolt-in-the-skull silliness. Her exact technical appraisal is, “Eeeeew!”. Can’t say I disagree with that. One final creepy thought —- there is no doubt that Vespasian’s, Second Augusta Legion used ballistas on the defenders of Maiden Castle. 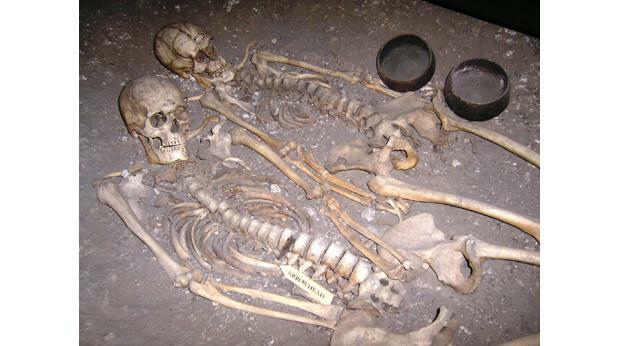 These famous artifacts displayed in the Dorchester museum, show that the broad shouldered fellow on the left stopped a ballista bolt with his spine. Standing up to Roman imperial ambitions was clearly a risky business. I was nodding off having a bit of a think about the implications of super accurate ballista fire in suppressing unruly bread lines during the later days of the Roman Empire. It’s the sort of thing I love to do when making banal justifications for why inswingers would have been such prized state secrets. You know, the kind the Romans would not want depicted on official statuary. Last I heard it was a flogging offense if you even mentioned an inswinger off-base. Anyway, my ruminations brought to mind an old Star Trek episode, …… the one where Captain Kirk meets the Bad Parallel Universe Spock. You can tell this Spock is the evil version because he’s the one sporting a goatee. A very naughty thing to do back in the Sixties when brainy radical types were particularly feared. Eventually Bad Spock shows our intrepid Captain a nifty toy he has stashed in his boudoir. It’s sort of a TV screen that can zoom in on any of his crew and, at the push of a button, make them vanish. Permanently. The ultimate form of crowd control for the ultimate form of police state. A precise, “execution button”, as it were. What does any of this have to do with the Ancient Romans? Flat shooting, highly accurate machines of the type we are testing would almost certainly have been used as precision sniper weapons to eliminate the unruly elements in a crowd. Weeding implements are always prized by fascists. They love all that push button efficiency. While it is perfectly clear from the historical record that Roman ballistas were used with great effect at ranges in excess of 300-400 yards, what is less widely appreciated is their uncanny precision and penetrative power for dealing with targets under, say, 100 yards. In an urban environment they would have been unmatched at picking off the opposition. In a crowded market place, across a courtyard, in front of the main gate, anywhere a field of fire could be established, their accuracy alone would have been profoundly intimidating. Firefly’s precision provides a visceral appreciation for this argument: Click for vid, 20111204144528(2) . The level of suppression this would engender when integrated with other forms of crowd control, is best left to the imagination. These would have been the days when the Bad Catapult Gods grinned large. 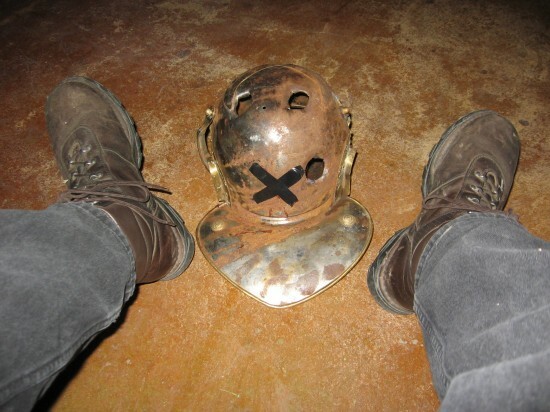 All the holes in this replica helmet were shot with 6516 grain bolt going 300 fps. 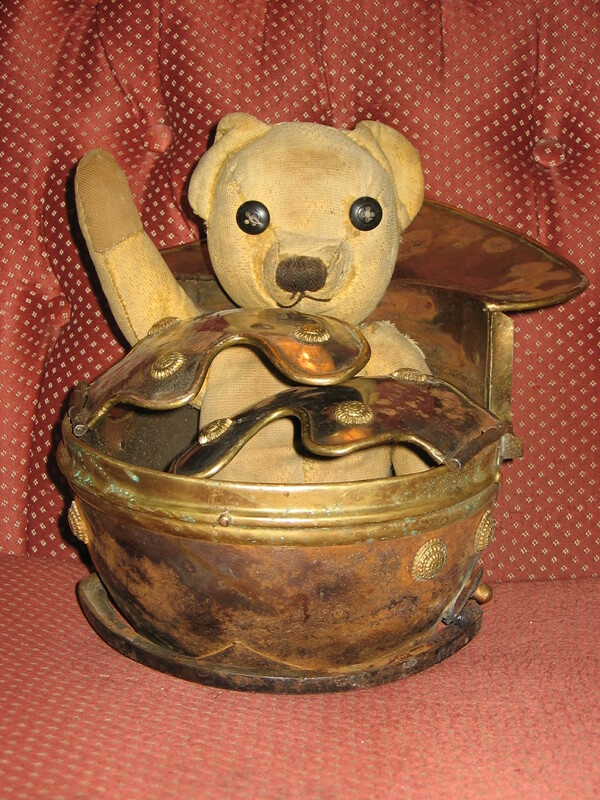 The shots were fired in a consecutive string over the course of several days, and were made when the helmet was angled in a different position for each shot. Range was fifty yards and there were differing levels of side wind up to twenty knots. If you have been following Firefly’s performance since the Mk. VIII limbs were installed, it is evident that an inswinger has very high levels of precision shooting capability. With long strings of 2″ groups at fifty-five yards, and projected groups of 4 or 5 inches at 100 yards (on a still day), it is not hard to see how the Romans may have valued the pruning capabilities of their carefully developed toys. Nasty, ruthless bastards that they were. Just like Bad Spock with his execution screen, the Romans would probably have been at pains to conceal any break-through developments. I believe there is a very good reason we do not see any unambiguous depictions of inswingers in the historical record. The day to day value of deploying compact, powerful, and accurate ballisatas (esp. inswingers, they having more of these qualities than any other) would lie in their ability to snipe with reliable head-shot precision out to ranges of 100 -150 yards. Covert tactics do not readily leave an imprint on history. Because I am admittedly getting a bit horrified by the incipient little gore-fest our research has spawned, I need a break from the ugliness for awhile. Poor, sensitive, girly-man, that I am. Dad came up from the ranks. He served an apprenticeship as a machinist at Westlands in WWII, and trained as a member of the Home Guard. After the war his talents as a designer quickly surfaced. By the mid-sixties, England had demonstrated that it did not value its areoplane engineers as much as America did. There was a noticeable gurgling sound around 1965 as the Great Brain Drain took hold. The British Invasion and all that. 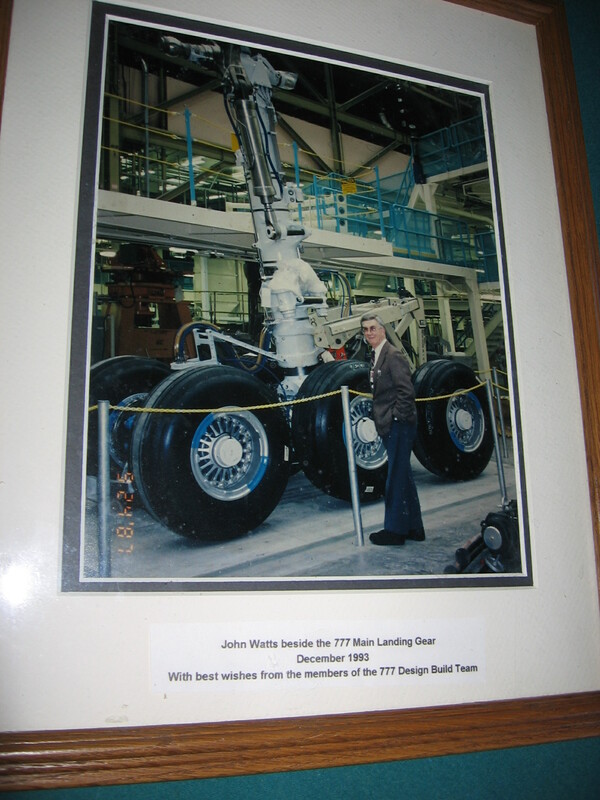 Forward to: Some time in the Eighties, an engineering conference room inside the Boeing Company. John Watts is in attendance. This was the very first meeting to explore the engineering options for a new design of main landing gear for the Boeing 777. After Dad made a presentation for a conceptual design , the leader of this discussion took pains to direct the conversation to a “well what did we do last time” kind of approach. The politicians running the meeting apparently did not approve of Dad’s radical new design, and he ended up getting dissed for his contribution. In the hallway after the meeting, Dad had to collar someone with the gumption to understand that his approach was the best viable way to save something on the order of four tons in weight on the finished gear. This is a huge amount of weight to save, and yet apparently it took a fair amount of effort to make his point. Kuddos Dad. 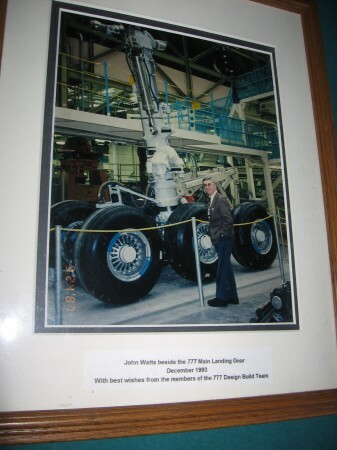 People started growing ears as they wrapped their heads around the savings, and ultimately Dad found himself the lead design engineer for the main gear on the 777. If you have flown in that plane, it is partly my Dad’s brainy bits you have to thank for a successful landing. The point is, there’s always a class of people, most people in fact, that obsess about the last approach that was taken. I figure it is just Human Nature. Dad did not suffer that impediment and his successful career was based largely on his ability to dream up entirely new stuff. Those of us that don’t have this kind of talent, myself included, really need to bow our heads in appreciation and understanding for those that do. It is only logical. What does any of this have to do with the Orsova artifacts we are investigating? Simple, it is not possible to look at the Orsova machine and not acknowledge that the design and construction of this type of machine was dreamed up by some truly original thinkers. The modular iron field frames that could be detached from the machine just by knocking out a few wedges, the wide open field of view beneath the steel arch, the lack of wooden parts that in old style machines used to take up bulk while also being liable to crack; there are a host of things that suggest the designers of these iron frame ballistas were not afraid to try something new. If we want to understand what an Orsova style machine actually looked like, it behooves us to drop the “how did they do it last time” approach and start thinking creatively, just as those ancient engineers clearly did. The chances are that the designers of the Orsova machine were smarter and more in tune with the thing they were making than many of the folks that have come along afterwards trying to explain how their devices worked. By fixating on arguments like “the Orsova machine had to be an outswinger”, the proponents of those arguments are engaging in the sin of being unimaginative in a situation that requires they appreciate the brilliance of the original designers. The safest set of assumptions about the Romans is that they were perfectly capable of fitting their field frames and kamerions together in the most efficient and powerful manner possible. Until someone can demonstrate that accurate replicas of the Orsova artifacts can be assembled in a configuration that can best Firefly in a shooting competition, I would humbly suggest that this silly debate about the existence of inswingers be tabled in the face of overwhelming firepower. Of course inswingers existed! How could they not and still contain the unique geometry that supports a machine like Firefly? Any lesser interpretation of the Orsova artifacts is just dissing the Romans. I have been asked to present a video showing Firefly’s complete loading and firing cycle. The sequence is long enough that I have to present it in two clips to stay under the 8 MB limit here on Word Press. My friend and neighbor, Josh Lorz, is apparently impervious to the cold. Ah! the vigour of youth! (1) Overall length of the sequence, 1.42 mins. (2) Preparation before first movement of the winch levers, 30 sec. (3) Length of time the winch levers are moving, 32 sec. (4) Remaining prep and firing, 40 sec. Short of ingesting more Ibuprofen, there is probably not a lot more that can be done to speed up item 3. However, items 2 and 4 could easily be shaved down by 10%, maybe 20% if we get with it. A minute and a quarter seems like a reasonable goal for the entire sequence. We’ll have another go in a week or so. Cutting back the twist in the bundles to lower the preload and allow a longer draw length, is not conducive to better velocities. The draw length here is our standard 33 1/2″. Why so short, when we obviously have much more draw length to exploit? Because this much draw takes us to 3700 lbs of draw force, and that is a sacrosanct limit I have imposed for safety reasons. These kind of limits are even more of a moral imperative if I have a helper in the area. This is all just a game, after all. …but I did manage a photo or two of this evening’s experiments. The shot into the right temporal bone that was administered yesterday, struck too far back and ripped out the bone on the edge of the skull. However, that shot still punched a single, well-defined corner of a square hole in the bone not effected by the break out. It was at least a hint that we were on the right track. I set up another test at even lower power. 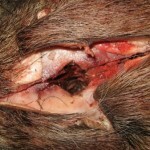 This time the target was the thick frontal bone. Aiming at these close ranges is as simple as projecting the path of the bolt with a broom handle. Not evident in this photo is the presence of my heavy roll away tool chest that I crouch behind for protection at the moment of firing. I cocked Firefly to her first notch and noticed that the limbs were barely drawn back at all. Draw length is a mere 13″. 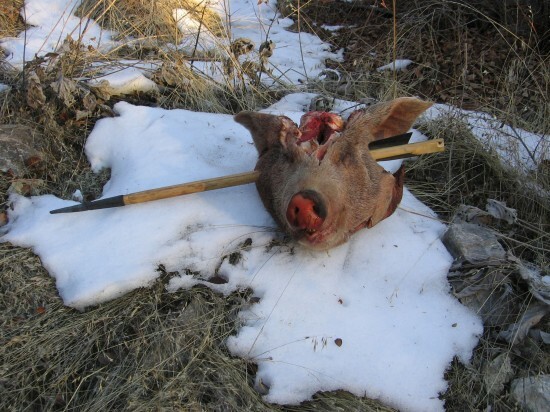 And yet it was sufficient to drive the 6 3/8″ long bolt head into the frontal bone of a new pig’s head, to a depth of 4″. The hole it left has the cleanly cut indications of a square, very similar to the wound in the Maiden Castle skull. 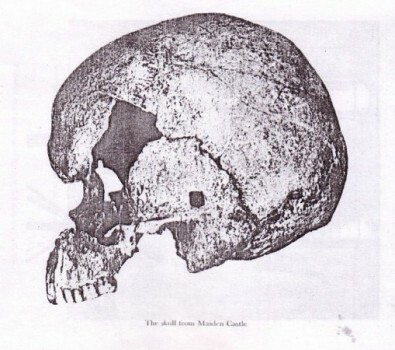 Note the longitudinal crack in the frontal bone. That is something not evident in the artifact. There are a good many imponderables working against the methodology we are using here. 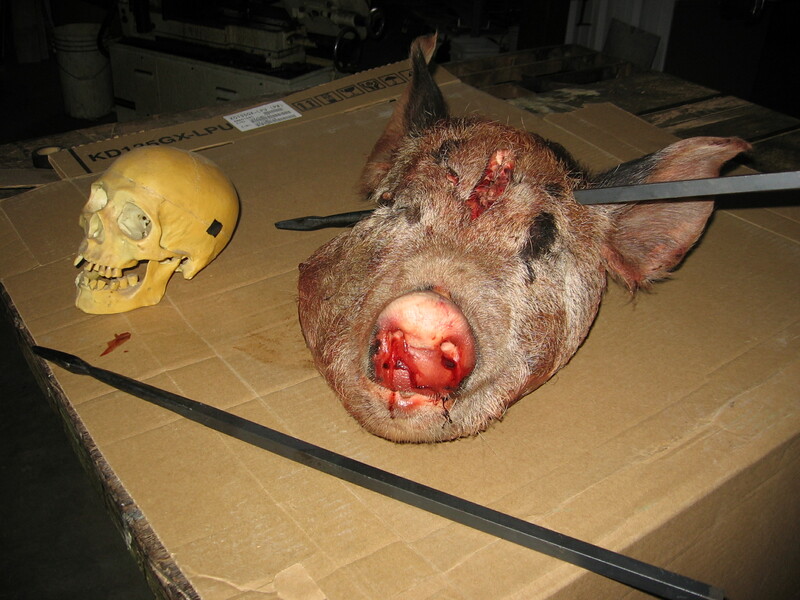 The evident thickness of a pig’s frontal bone compared to a human’s temporal bone, being chief among them. I am still not sure how close an analog any of this actually is for the square shaped wound in the Maiden Castle skull. The temporal bone of any human, even a brawny Durotrigen, seems so conveniently thin a place for a blow to be directed to. 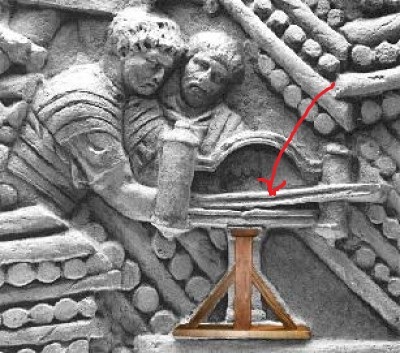 For a Roman execution squad wielding pilums, it’s a very likely place they would have made their thrust. This pilum theory was advanced convincingly by Mr. Wilkins in the BBC program that covered this topic. The mystery of the Maiden Castle skull is a far from settled matter in my mind. If anything, I tend to favor the pilum theory. 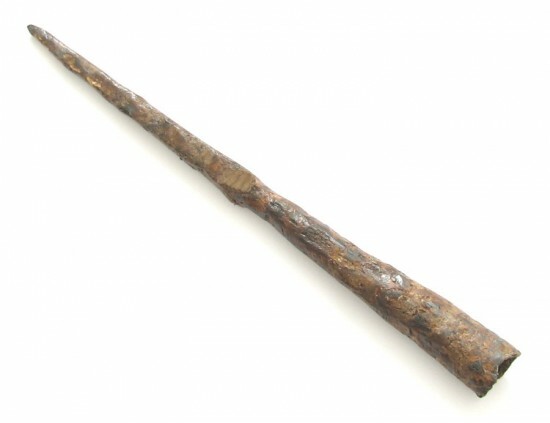 The set of conditions needed to punch a square hole in thin bone seems to be a lot narrower with a speeding ballista bolt than it would be with the thrust of a hand driven spear point. I suppose for this set of tests to be complete I will need to make up a pilum and take a few stabs at Porcus with it. Every experiment needs its control group. While I have my doubts about the methodology we are pursuing here; still, all this probably means something, right? If nothing else, I am developing techniques for test firing in a more lab-like setting. It is important to use shielding in these close range tests to protect the operator from any potential bounce-backs or ricochets. Clearly it doesn’t take much in the way of energy to knock a hole in one’s head with a sharp pointy thing. I wouldn’t want to inadvertently find myself in the role of the perfect analog. Also, I still need to move Firefly back to the old test range and measure the speed of today’s shot by performing one just like it over our Doppler chronograph. Then the pondering can really begin. Okay, it’s a few days later now, and I’ve come back to do those velocity readings on these slow shots. The shot that made the square hole seen above, with a 13″ draw, was slouching along at 105 fps. 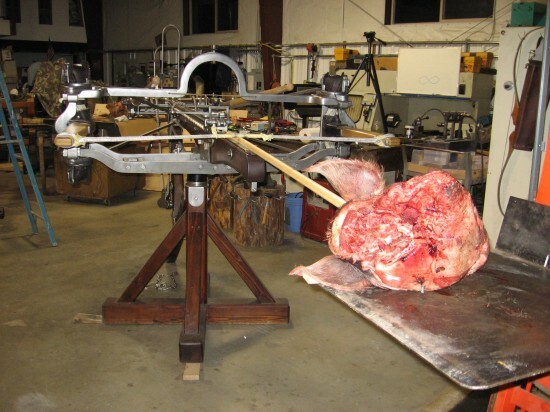 The shot from the previous day, with a 15 1/2″ draw and made into the pig’s temporal bone, was going 133 fps. I’m somewhat surprised that these speeds are as high as they are given the laughably short draw lengths and limb retraction. In this next video the catch assembly can be seen to retract dramatically after the shot. This is because the winch ropes were still in tension and the draw force had not been transferred to the side plates via the two hooks on the assembly. I have never tried firing Firefly in this manner before and thought I would take advantage of this very low power shot to see what the effect would be. Draw length here is only 15″ because I am trying to reduce the power to the level that only the entry side of the skull is penetrated. I am guessing that the speed of this bolt was well under 100 fps, probably close to the kind of velocity that it would be going at it’s maximum range, just falling out of the sky. An equivalent shot, with the chrono hooked up, will tell us for sure. In any event, the penetration depth was exactly what I was hoping for to test this Maiden Castle, bolt-in-the-skull hypothesis. The depth of the bolt head was actually 3/4″ deeper than seen here. I just knocked the head back out a bit to make it visible for the photo. Dissection to follow. Courtesy of the Second Augustan Legion. In trying to figure out which of Vespasian’s orders resulted in inflicting wounds on the defenders of Maiden Castle , similar to the small square hole in the temporal bone shown in this next photo, Firefly finds herself playing the role of a Skorpion. Photo from, Greek and Roman Artillery, by E. W. Marsden. As a projector of bolts, Firefly’s role in this current exercise is largely just as a stand in for the type of ballista General Vespasian’s Augusta Legion was using back in 43 BC for cutting down the opposition in Dorset. I hear he very much valued his catapultiers. In the following video, I find myself having a good long think about the next step in this series of experiments that tests the ability of a sharp, four sided bolt head to cut a clean square hole in cranial bone. In short, to duplicate the wound pattern seen in the above artifact. The close range lab set-up we are using here is just not suitable for the Doppler chronograph. Measuring the velocity will have to be done using the same bolt and the same draw length, back on our original test range. My attempt to reduce the power sufficiently to eliminate over-penetration, met with this little set back. 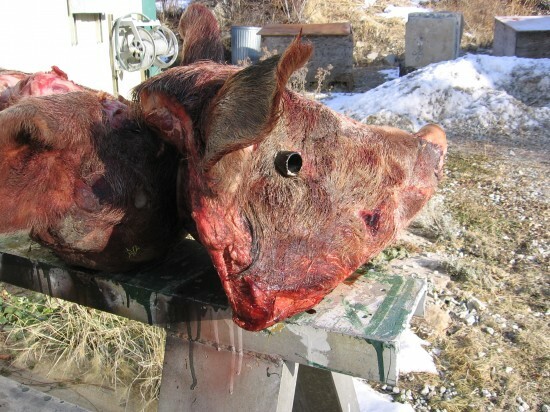 Time to take another pig’s head out of the freezer and lower the velocity again. I had reduced the draw length on this shot down to 25″ from 33 1/2″. Next I’ll try just fifteen inches of draw. That should be pretty slow, and will hopefully result in an entry wound no deeper than the quadrobate section on the bolt head. I realize that, quite coincidentally, this series of tests is also demonstrating the wounding potential of heavy ballista bolts at long range, where their velocities would have slowed to levels similar to what we are generating now. It will be important to know what kind of speeds we are talking about here in order to make future comparisons.